Mid summer model mayhem! Update Saturday am: Rapidly changing situation… recent runs (2 charts below) show much reduced risk of any thundery activity later this week; perhaps some Monday pm and eve but ridge building over South should calm things down but shut door on any big heat from Europe. Keeping air flow westerly and unsettled. Things are changing on every run so check back for updates! This week could see a warm plume of air from southern Europe causing temperatures to rise significantly in the South especially. This may also bring thunderstorms. A real mix this week of wet, windy, dry and sunny, warm, humid and thundery weather could be on the cards. Check back for updates as things get clearer! The North and Midlands saw some very thundery downpours today, whilst the south experienced unseasonably high winds over 50 mph in places. Reigate had peak gusts of 33 mph being sheltered by the Downs and Priory hills surrounding the town here! Anyhow, it could potentially be the turn of the SE to see some (more?) severe weather later next week, but it’s a long way off so stay tuned for updates and on @RGSweather on twitter. The weather really is not going to play ball next week despite being on the run-up to the longest day of the year. 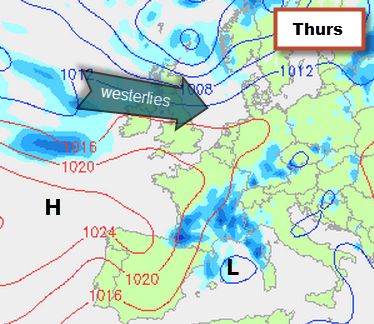 Some decent warm weather is possible mid-week but much of the rest looks unsettled, showery at times and occasionally windy too: it’s hardly looking summery except the potentially warm maximum temps mid-week prior to any thundery interlude later on. Whilst Reigate temperatures could be set to rise to 23ºC by middle-late in the week as air from a heating Europe is fed our way, any potential temperature “spike” is likely to be regrettably brief and spark off showers and even thunderstorms as pressure stays low. This remains uncertain and will change but models are suggesting a potential “heat leak” from the continent over the SE for a short time later next week but, as suggested, if this happens it will be accompanied by very heavy thundery downpours for the SE. 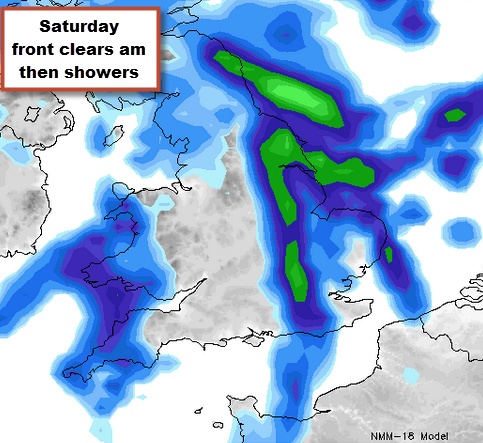 Before all that potential excitement, the start of the weekend will be dominated by the passage of a classic depression with a perky cold front carrying some moderate to heavy rain crossing the entire country overnight Friday and clearing the east coast on Saturday morning. A strong jetstream will push this through quickly. This will leave a breezy day of sunshine and isolated showers hanging around for most of Saturday, though the UKMO plays these showers down. 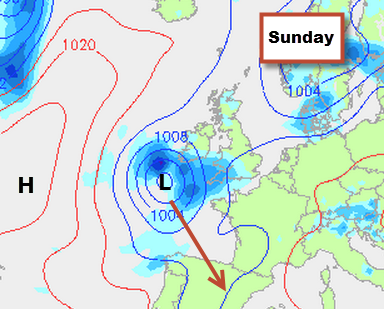 Sunday looks cloudy and mostly dry until later in the day when another low, this time approaching from further south west, brings potentially heavy thundery showers to Reigate on Monday afternoon as it lingers near the SW. Rain could linger, lighter, through Tuesday. This low is not due to cross the UK, instead it will sink south and then yo-yo back up later in the week. Now, there is a chance of some big thunderstorms getting into SE England around mid-week. Most models agree that a trough will develop as the LOW sinks south. 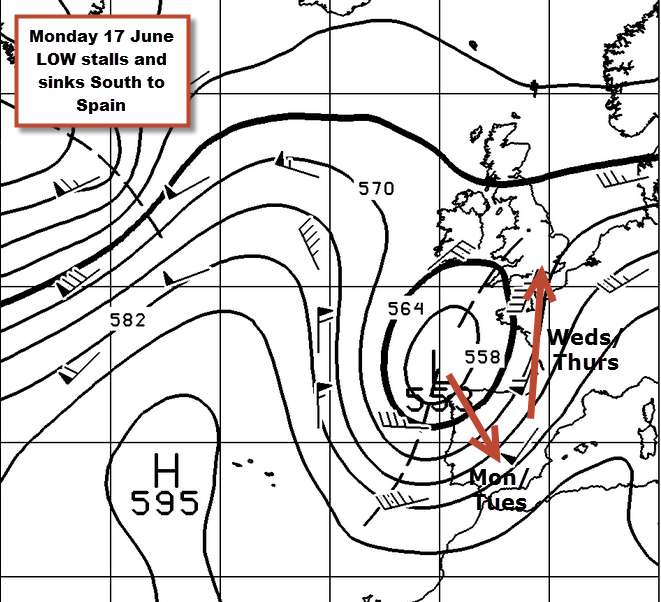 The jet stream will cut off this low as it floats around Spain for a day or two basking in heat and warming through. The story thereafter becomes uncertain but the cut-off low could yo-yo back north and feed some continental heat and energy back up north to the UK by Weds/ or Thursday. Heat advecting into a cool UK will increase lapse rates (decrease in temps with height) and could set off whopping convective showers and thunderstorms. Another measure of thunderstorm potential is called lifted index (shown below) The Lifted Index (LI) is defined as the temperature of a rising air bubble when it reaches about 5,500m subtracted from the actual temperature of the environmental air at 5,500m. If the Lifted Index is a large negative number, then the parcel will be much warmer than its surroundings, and will continue to rise = convection! Thunderstorms are fueled by strong rising air which remains much warmer than the air surrounding it (like a rising hot air balloon) thus the Lifted Index is a good measurement of the atmosphere’s potential to produce severe thunderstorms. 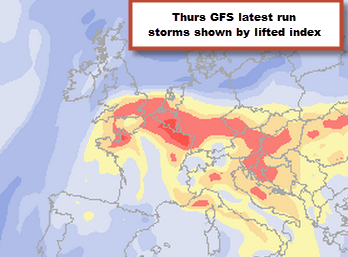 The map below is the latest GFS run showing LI across Europe on Thursday. Note the salmon red colours in UK! The movement and location of this YO-YO low is critical in determining whether this happens at all. If it matches the GFS it could cause significant thundery weather by dragging in a “lick” of very warm air over the south east and east of the UK, if it runs with the ECMWF it will probably stay south, moving further east and fill over the continent and be potentially less interesting. Worth watching the yo-yo low!